Check out ngims Publishing’s other illustrated literary classics. The vast majority of our books have original illustrations, embedded audiobook, navigable Table of Contents, and are fully formatted. Browse our library collection by typing in ngims plus the title you’re looking for, e.g. ngims Gulliver’s Travels. 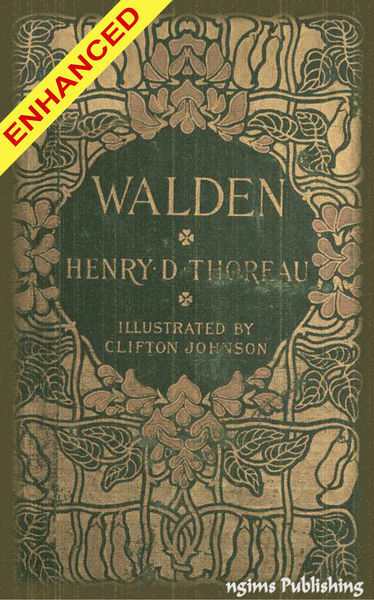 Walden is an American book written by noted Transcendentalist Henry David Thoreau. The work is part personal declaration of independence, social experiment, and voyage of spiritual discovery, satire, and manual for self reliance. Published in 1854, it details Thoreau’s experiences over the course of 2 years in a cabin he built near Walden Pond, amidst woodland near Concord, MA.